Like any other games, starting with the correct technique, learning and understanding of the correct movements of the body (i.e. hands, arms, lower body and upper body) is the most vital fundamental for golf swing. The golf club is only an extension from your hands; you will understand every aspect on how to swing the golf club to hit the ball. We will emphasize on the physiology of the body in facilitating a golf swing. At Asian Golf Centre, we will teach, explain and demonstrate to how to attain that all-important of the golf swing through the lessons incorporating with Neuro-linguistics programming (NLP™), golf sport science principles and golf psychology knowledge. You will be taught the patience, passion, skills and comprehension to not only enjoy swinging, but to continue to improve beyond your athletic abilities. We may be video recording your swing during the swing training lessons at the practice range. This is for us to playback to review and track your golf swing progress for improvement and refinement. requires for the golf swing. 2. You will acquire all the importance of the body setup with the golf club for making the golf swing. leverage to make an efficient golf swing. 4. You will learn the dynamic movement of the body requires to hit golf ball efficiently. 5. Our dynamic swing drills training for accelerated golf swing learning. 6. Our attentiveness to help you to develop your golf swing. This programme is design for potential golfer with no knowledge and experience of the golf swing and looking for an effective and efficient coach to start their golf swing correctly. The goal is to learn and practice the correct golf swing to get started in participation of the game recreationally. Our requirement: Come for golf swing lessons with full enthusiasm of wanting to start playing the game of golf - a game of a lifetime. 4. The golf equipment and attire. 5. The golf swing technique required for the game. 7. Warm-up for your golf technique performance. Why is it important to know? This lesson teaches a beginner golfer the must know preliminary knowledge for a golf technique. It is the setup of the body with a golf club for an efficiency golf swing technique performance. The golf swing posture is accounts to 80 percent of the golf swing technique performance. 1. You learn the components of an iron golf club: grip; shaft; ferrules and clubhead. 2. You learn the type of material that made each component of the golf club. 3. You learn the construction, size and weight of a golf ball. 4. You learn why a golf player needed several types of golf clubs for golf game? 5. You learn the specific 'anatomical position' of the golf swing posture. 6. You learn what is a correct 'Address Position' for a golf swing technique? 7. You learn what is 'Preliminary Movement and Posture Stability' in golf sport science principles for the golf swing technique. 8. You learn the correct feet standing position at Address Position. 9. You learn the correct spine tilting angle at 'Address Position'. What is 'Flexion and Extension' golf sport physiology? 10. You learn the correct knee bowing position at 'Address Position'. 11. You learn what are 'Kyphosis and Lordosis' postures relating to golf sport physiology and medicine? 12. You learn the correct 'body weight distribution' on the feet at Address Position according the Bio-mechanic first principle of stability. 13. You learn the cause and effect on incorrect body weight distribution on the feet at Address Position. 14. You learn the golf gripping styles: Ten-fingers; Inter-locked and Over-lapped grip. 15. You learn the 'Key points' on the position of the fingers and hands when holding the golf club. 16. You learn how to hold the club correctly with the correct fingers tension. 17. You learn the symptoms, cause and effect of holding the golf club with incorrect fingers tension. 18. You learn the 'Key points' on where to position your arms and hands at Address Position? 19. You learn where to position the golf club and golf ball at Address Position? shape with a golf club. 21. You learn what is an 'Open, closed and square clubface' at Address Position? 22. You learn the effect of open, closed and square clubface positions when impact on the golf ball. This lesson teaches a beginner golfer the must know knowledge and skill to perform the golf arm-swing technique. The goal is to produce a golf ball flight performance accurately to targets of up to 30 meters. This is an essential golf swing skill for a beginner golfer. 1. You observe the performance of an efficient golf arm-swing technique. 2. You learn the golf ball flight trajectory of a golf arm-swing technique. 5. You learn the correct right and left hand movements for a golf arm-swing technique. Why is it important to know? 6. You learn what is 'Abduction and Adduction' arms movement in sport science principles relating to the golf swing technique? the most important part of golf sport science's 'Motor Skill Learning and Training'. 8. You learn how to start the 'Back-swing' (take away) correctly? 9. You learn the correct 'Down-swing' and 'Follow-through' dynamic movements for an efficient golf arm-swing technique. 10. You learn the correct wrist 'Flexion and Extension' movements for an efficient golf arm-swing technique. 11. You learn the correct clubhead swing motion and swing path. 12. You learn what is 'Shaping and Chaining' in golf sport science principles to assist your patterning for the arm-swing technique. 13. You learn how to hit the golf ball accurately with ‘Hands-eye co-ordination’ by applying sport science psycho-motor skill. 14. You learn what is 'Dynamic descending angle of impact' of the golf clubhead on the golf ball? 15. You learn what is 'The Critical Instant' when the clubface strikes the golf ball? 16. 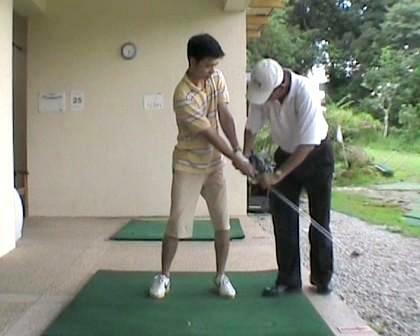 You learn the correct arms and hands positions with golf club after the clubface impacts on the golf ball. 17. You learn where is the most important part of the golf swing action. Why is it important that you MUST know? 18. You learn the symptom, cause and effect of your golf ball flight performances. What is a 'Topped and thin shot'? 20. You learn what are the Auditory sub-modalities in NLP™ for your golf arm-swing technique? 21. You learn what are the Kinesthetic sub-modalities in NLP™ for your golf arm-swing technique? 22. You learn what is 'Process goal' in golf psychology and the application for your golf arm-swing technique? This lesson teaches a beginner golfer the must know knowledge and skill to perform the golf iron full-arm swing technique. The goal is to produce a golf ball flight performance accurately up to 80 meters. This is an important golf swing skill for a beginner golfer. 1. You observe the performance of a golf full-arm swing technique. 2. You learn the golf ball flight trajectory of a golf full-arm swing technique. 4. You learn how to do static and dynamic golf full-arm swing drill training at various intensities. 6. You learn how to do 'Flexibility and agility' golf swing drills for the golf full-arm swing technique. 8. You learn what is body 'Lateral and Rotation' movements that can has an effect to your golf full-arm swing technique. 9. You learn the 'Functions of the lower and upper body' for the golf full-arm swing technique performance. 10. You learn how to rotate the shoulders correctly to facilitate the golf full-arm swing movement. 11. You learn the correct golf 'Back-swing, Down-swing and Follow-through' movements for the golf full-arm swing technique. 12. You learn the correct wrists 'Flexion and Extension' movements for the golf full-arm swing technique. 13. You learn the importance of the 'Dynamic palms position' for the golf clubface to strike the golf ball effectively. 14. You learn the correct body muscles group usage for the golf full-arm swing technique. 15. You learn what is 'Swing angular acceleration' in bio-mechanics for the golf full-arm swing technique? 16. You learn the golf sport physiology knowledge on 'Weight-transfer' during a golf swing action. 17. You learn the symptom, cause and effect of your golf ball flight performances. What is a 'Hook and slice shot'? 18. You learn how to pattern your golf full-arm swing technique by focusing on the 'Process goal' in golf psychology. 19. You learn to improve your the golf ball striking effectiveness by applying the NLP™ Sub-modalities. 20. You learn the 'External focus' of your golf full-arm swing technique by applying NLP™ Visual and Auditory modalities. 21. You learn what is 'Intrinsic and Extrinsic feedback' in golf psychology of your golf full-arm swing technique performance. This lesson teaches a beginner golfer the must know knowledge, skill and attitude for the golf iron full swing technique. The goal is able to use different iron clubs to produce different ball flight performance accurately to various distance targets (putting greens) on the golf course. This is a proficiency golf swing skill for a beginner golfer. 1. You observe the performance of a golf iron full-swing technique. 2. You learn the golf ball flight trajectory of a golf iron full-swing technique. 3. You learn the application of the golf iron full-swing technique for your game. 4. You learn the correct left and right arm 'Abduction and Adduction' movements for a golf iron full-swing technique. 7. You learn what is the body 'Flexibility, Agility and Mobility' and application for your golf iron full-swing drill training. 8. You learn how to start the 'Back-swing' (take away) correctly. Why is it important to know? 10. You learn the correct finish-swing posture 'Hyperextension' movement of the body for your golf iron full-swing technique. 11. You learn the correct wrist 'Radial flexion and Ulnar extension' movements for an efficient golf iron full-swing technique. 12. You learn the correct clubhead swing motion and swing path. 13. You learn what is 'Shaping and Chaining' in golf sport science principles to assist your adaption for the golf iron full-swing technique. 14. You learn how to hit the golf ball accurately with ‘hands-eye’ timing by applying sport science psycho-motor skill. 15. You learn the symptom, cause and effect of your golf ball flight performances. What is 'magus effect' of the golf ball? 16. You learn and understand the 'Tempo, Rhythm and Timing' of the golf iron full-swing action. 17. You learn what is 'Dynamic Postural Stability' in Bio-mechanics and the application for the golf iron full-swing technique? 18. You learn how a body moves in 'Deliberation, Anticipation and Reflex' during golf iron full-swing technique? 20. You learn the neurology senses that affect your 'Dynamic Postural Balance' during your golf iron full-swing action. 21. You learn golf sport science knowledge on 'Correct Breathing Technique' for golf iron full-swing technique performance. 22. You learn what are the 'Ball flight laws'? Why is it important to know? 23. You learn the symptom, cause and effect of your golf ball flight performances. 24. You learn what is performing your iron full-swing technique within your physical and athletic ability. 25. You learn what is 'Attentional Control' in golf psychology and the application for the golf iron full-swing technique. 27. You learn to improve the golf ball striking effectiveness by applying the NLP™ Sub-modalities. 28. You learn the 'External focus' of your golf iron full-swing swing technique by applying NLP™ Visual and Auditory modalities. 29. You learn what is 'Intrinsic and Extrinsic feedbacks' in golf psychology of your golf iron full-swing technique performance? This lesson teaches a beginner golfer the must know knowledge, skill and attitude for the golf fairway-wood swing technique. The goal is able to produce a longer distance ball flight performance than the irons clubs. This fairway-wood club is use to play the tee-shot for the long Par-3 holes and on the fairway for Par-4 and Par-5 holes. used to made a golf fairway-wood clubhead. 2. You observe the performance of a golf fairway-wood swing technique. 3. You learn the golf ball flight trajectory of a golf fairway-wood swing technique. 4. You learn the application of the fairway-wood swing technique for your game. 7. You learn the cause and effect of incorrect posture setup for a golf fairway-wood swing technique. 10. You learn the correct finish-swing posture - 'Hyperextension' movement of the body. 12. You learn and understand the swing plane, swing path and impact clubface angle that causes the golf ball flight directions. 13. You learn what is a 'Two-lever' swing system for the golf fairway-wood swing technique? 16. You learn the symptoms, causes and effect of the golf ball flight performances. 17. You learn the 'Effective clubface position and Loft angle' at impact on the golf ball. 18. You learn the sport science knowledge on 'Correct Breathing Technique' for golf fairway-wood swing technique performance. 25. You learn what is self-assertive state of 'Conscious Competence' of your golf fairway-wood swing technique performance? This lesson teaches a beginner golfer the must know knowledge, skill and attitude for the golf driver swing technique. The goal is able to drive the golf ball to the farthest distance on to the fairway of the golf course within your physical and athletic ability. The golf ball is plays on a tee for the first golf shot of every Par-4 and Par-5 holes. 1. You learn the technical design of a golf driver club: length; weight; horizontal bulge; vertical roll and perimeter weight distribution. 2. You learn the type of materials specially used for making the golf driver club. 3. You observe the performance of a golf driver swing technique. 4. You learn the golf ball flight trajectory of a golf driver swing technique. 5. You learn the application of the driver swing technique for your game. 6. You learn the golf ball 'Tee-up position' in relation to the lowest arc of the golf driver swing path. Why is it important to know? 8. You learn the cause and effect of incorrect posture setup for a golf driver swing technique. part of golf sport science's 'Motor Skill Learning and Training'. 11. You learn the correct finish-swing posture - 'Hyperextension' movement of the body. 12. You learn the most important dynamic impact zone of the golf driver swing action. 13. You learn and understand the swing plane, swing path and impact clubface angle that causes the golf ball flight directions. 14. You learn what is a 'Two-levels' swing system for the golf driver swing technique. 15. You learn the bio-mechanic principle of 'Angular acceleration and Velocity production' for the golf driver swing technique. 18. You learn the symptoms, causes and effect of the golf ball flight performances. 19. You learn the 'Effective clubface position and Loft angle' at impact on the golf ball. 20. You learn the sport science knowledge on 'Correct Breathing Technique' for golf driver swing technique performance. 21. You learn what is 'Attentional Control' in golf psychology and the application for the golf driver swing technique performance. 24. You learn what is the distinct 'Anaerobic Alactic Energy System' in sport science principle for golf driver technique performance. 25. You learn what is 'Intrinsic and Extrinsic feedbacks' in golf psychology of your golf driver swing technique performance? 26. You learn what is self-assertive state of 'Conscious Competence' of your golf driver swing technique performance? 1. Consider to create a plan to achieve your golf aspiration. 2. Get a set of golf equipment to suit your physical ability and golf swing characteristic. 4. Record your golf shot distance performance for each clubs in your golf bags during your practice. 5. Prepare yourself to sign up for the 'Beginner Golfer Short Games Swing Technique Programme'. 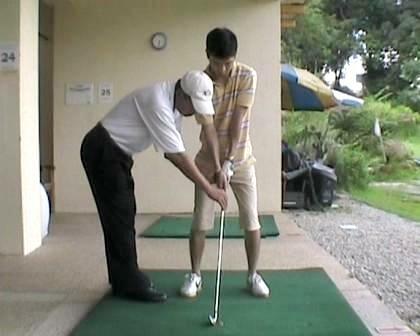 The Beginner Golf Swing Technique Learning and Training Programme comprises of 6 lessons. The lessons are by appointment only. Training golf clubs will be provided for each participant during golf swing technique lessons only. Participant	must wear proper golf attire for lessons. Participant is required to purchase the practice range golf balls for lessons. $200.00 per participant for group coaching of 4 participants together. $250.00 per participant for group coaching of 3 participants together. $360.00 per participant for group coaching of 2 participants together. golf lessons date and time arrangement.